South Dakota has always been a leader in renewable fuels and current state legislation looks to make sure that the progress continues. 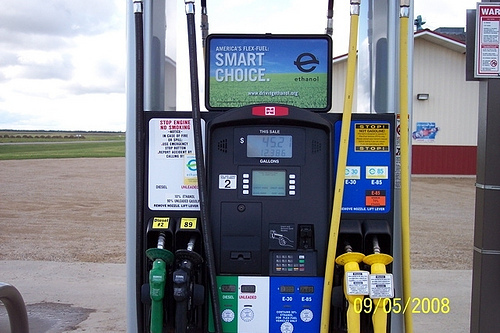 House Bill 1192 would create a grant program using $1 million in federal stimulus money through the American Recovery and Reinvestment Act of 2009 and would be used for the installation of additional ethanol blender pumps in South Dakota. The grants would be issued between April 1 and May 28 of 2010 exceeding no more than $10,000. Gas stations are allowed to receive more than one grant if they choose to install multiple blender pumps. The prime sponsor of the bill, Representative Mitch Fargen of District 8, received bipartisan support as the bill passed the House State Affairs Committee unanimously 13-0 on Thursday, Feb. 18. The bill now moves into the Senate for consideration. The bill is modeled after past blender pump infrastructure programs developed by the South Dakota Corn Utilization Council which has been successful in establishing over 40 blender pumps across the state. Ethanol blender pumps are nothing new to South Dakota. In fact, South Dakota was the first state to install the pumps thanks to the South Dakota Corn Utilization Council. SDCUC continues to be a leader in the ethanol industry by adding additional infrastructure and looks to continue its progress with the current legislation. This entry was posted in Education and tagged Blender Pump, corn, ethanol, House Bill 1192, Mitch Fargen, SDCUC, South Dakota.